People have not given a fair mandate for the JVP to combat corruption in the country, former Auditor General and JVP National List MP Sarathchandra Mayadunne said in a special statement to the parliament. In what became an inaugural as well as farewell speech Mayadunne said that the polls results at the last general election once again showcased that the people still do not have enough desire to get rid of the corrupt culture which prevails in local politics. He posed the question whether the Sri Lankan electorate at large was bold enough yet, to accept intellectuals like him to wage battle against corruption and malpractices. Speaking on his surprise decision to first accept and then resign from the national list slot, Mayadunne said that his decision to resign was an independent one. He said that the JVP had urged him to stay. He went on to thank the party for keeping faith in him even though he was an outsider. Mayadunne chose to focus on corruption in his entire speech and went on to state that although the President in his speech in Parliament recently had stressed his determination to create a country sans corruption, an analysis should be done on how far people have accepted this fact. A visibly disappointed Mayadunne went on to say that in this backdrop he was of the view that his role in parliament could be limited, as people has not shown enough faith in changing the current petty political culture. Absolutely agree with this statement. Sometimes I feel that granting franchise to all over 18 is inappropriate, without setting some qualification to enjoy the right of franchise. At the just concluded election most people were misinformed and deceived and it was an election marred by racialism. Maps were shown to the people with images of divided country creating fear in them. And Rajapakse went on to say that people in the south will have to have visa to visit northern part of the country and Ranil would surrender him to West to charge him for war crimes. He used racialism as the main trump card. In my view, there should have been a blanket ban on this type of false utterances motivated by racism that made illiterate people, who could not comprehend the motive behind these statements to vote for him. As Mr Mayadunne correctly said the electorate has still failed to realize the real reasons for the worsening of the Lankan economy, denying people a decent life. Corrupt politicians are fully aware of this situation and exploit it to their advantage. Dumb and stupid Sri Lankan electorate does not deserve public servants of Mr. Sarathchandra Mayadunne’s stature. Period. Excellent statement. I have great faith in Maithri still, but it gets shaken when the likes of S.B. Dissanayake, Thilanga Sumathipala and Kalu Soysa are appointed to Parliament. Maithri probably has an intense dislike of them, which he has possibly subordinated to the need to marginalise MaRa. However, the fact is that a huge majority has rejected these corrupt individuals whose incomes come from anti-social activities. Thanks, Mayadunne. You have written a message; it is up to us, the readers of it to convey that message to those who imagine that politics is not important enough to bother about. This is the Democracy, which ensures that people are governed the way they deserve. Intelligent comments from the Customs whistle-blower Nagananda. It was the false and deceptive Sinhala propaganda – utterly false – that the TNA and the Tamils worked to an agenda to divide the country that brought in the votes to that ace racialist and plunderer Mahinda R and the UPFA – from an otherwise illiterate Sinhala Buddhist electorate. The truth is completely different. Tamil wants to join hands with the Sinhalese to develop the country and save it from the rapacious hands of rogues like the Rajapakses, SBD’s, Siripala Silvas, Premjayanths and a whole bunch of otherwise scheminging and efficient blood-suckers who have clawed their way, once again, to Parliament hoping and conspiring to be Ministers. Despite the civil service being made a slavish private property of scheming politikkas in the past few decades, we still have patriotic and honourable gentlemen like Mr. Mayadunne and EC Deshapriya. I salute the former AG’s stand to enter politics as well his principled decision to leave the snake-pit – on honourable grounds. 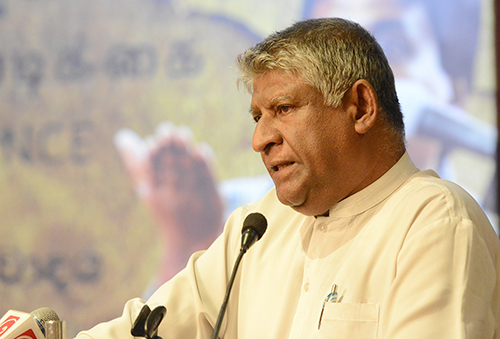 But Mayadunne, Ranil, CBK or Sumanthiran – like a single swallow cannot make a summer, cannot save the country from utter rogues who dominate Parliament – lead by clueless Gamayas and blundering fools. I agree Ranil and CBK are not entirely free of stain of one variety or the other in their own careers. The curse that overtook the country in 1956 is still with us. It is very unlikely we will again see honourable Parliamentarian-politicians like Dudley, SWRD, MD Banda, Dahanayake, Chelvanayakam, Thondaman, Sivasithamparam et al who loved and worked for the country, all its people and its unity. Henceforth it will be bookies, kudu-karayas, Casino Kings-pimps, murderers and rogues who will henceforth be in the forefront – unless some form of divine intervention occurs in the interim. I still admire Maithri, but must he go against his own inclinations to appoint S.B. Dissanayake and Sumathipala whov’e been making money through anti-social activities. They were very well known to the Public who clearly rejected them. On the other hand, the JVP may have failed mainly because many voters transferred their votes to the UNP because they felt that MaRa was still a threat. Because a good fraction. at least 30% are Modayas, Mootals and Fools , going by the 300,000 votes received by Wimal Buruwansa, of 2/2 =0. fame. Please disregards the votes of the Idiots with IQs around 65. So, Let us See those who voted against UPFA-MaRa and Cronies, and those who Voted for MaRa and cronies. Don’t be irrational. Let’s see…. 1. Mostly Educated with at least GCE OL, AL and a degree. 2. Mostly cultured and soft spoken. 3. Mostly adaptive to other cultures. 4. Moslty good citizens who believe in rules and regulations of their country. 1. Few are well educated(>10%). Rest are usually primary school dropouts. 2. Very rude with others. Not humble at all…..forget soft spoken. 3. Always want to impose their culture & lifestyle on others. 4. Never follow rules & regulations. Try to fraud in tax. 5. Are Liars, Corrupt and are Crooks and criminals. One can see who is better citizen. Well, well, well, there was a time when we only allowed landed proprietors to vote, and to decide what was good for the country. These top people (whose poo didn’t smell)told the ordinary man to mind his business, and the women to stay at home. Those were such good times. Then that suddha fellow by the name of Donoughmore came along and upset the applecart by giving the vote to every Siripala, Sirisena and Leelawathie. His sentiments should echo in many minds around the country. However he should not have resigned. He could have been the conscience of the people in parliament and exposed evil and corruption. It would have had a cascading effect. There had to be a beginning and this was a significant one. Unfortunately, his voice would have been formidable in the opposition. Mr. Mayadunne has copped out and in the process let down a lot of people and the JVP. I salute Sartchandra. We need people like him to echo a wakeup call to Srilankans. This action makes news and get people to think. It is slow but every drop of wake up call can make gradual step towards changing the current petty political culture. This is the dilemma MY3 is facing I suppose but I hope MY3 will not let down the people who voted him to change the political culture by making deals with the cronies which goes fundamentally against the principles he promised to uphold. Spot on. We proved this – looking at the manner once defeated President received more votes even if all and sundry are clear of the huge damage done by him and his thugs. Even today, the bugger is resistent to pay a smile (real or unreal is an another question) and sit as nothing was the case from his side – can you imagine ? As you and the few saying these folks would never learn it. So how can anyone help the nation. They would love to be sunk in Courrption rather than lining up to become civilzed. Evne if your kith and kin would have been abducted, they would not react. To react indifferent as no other is their way. I think our people are not that natured and cutlred than had been years before. With the Internet revolution, they have become feelingless creatures. I guess lot of us can understand what you says here. However, if majority of people actively oppose corruption, then there is nothing you have to do in the parliament either.. When it come to actions, majority is part of corruption, that is the problem. So we need people like you with voice to make make a difference, even a small one in positive direction. Well said, I am of the same view.We need more people like Mr.Mayadune. I agree with what Mr.Mayadunne said. However the fact remained that there was no proper dissemination of information to the Public mostly due to the fact that this election was held immediately (within five+ months) of Yahapalanaya Government. The campaign to air out bribery,corruption and other related financial crimes committed by the previous regime did not reach the discussion level of the voter. Instead, the “Nugegoda Street Drama” enacted by the “Foursome” gained momentum and allowed to go unchallenged and that fueled the slogan to “Bring Back Mahinda- the War Hero”. All the allegations of corruption, bribery and other financial crimes were allowed to be termed as “Mada Gehilla (slinging mud campaign)and the people were made to believe it to be so, purely because of the lethargy shown by the Government in the process of investigations and inquiries. Having said that, I also cannot believe how supposed to be educated, well informed, high literacy rated and fair thinking category of Government employed personnel voted at the elections. They saw and had the BEST campaigned manifesto, the most suitably nominated candidates and the ideal programme of work presented by the JVP to consider. Yet how many or what percentage voted for that party? If that was and is the TREND and PATTERN of voting by that segment of the voters, what do we have to think of the rest. That NEGATIVE TREND on the part of the so called “High Literacy Rated” voter was the determining factor for people like Mr. Mayadunne (who himself was a high ranking State employee)to accept and remain in the Legislature of this country. In that context Mr. Mayadunne made the correct decision of leaving the Legislature specially as a person who gained entry via the National List. I welcome that decision and hold him as another National Hero whose name would be written in the history as the least period served MP who also set an EXAMPLE to others to follow. Well done Mr. Mayadunne. People didn’t consider voting the JVP to combat corruption as the priority in this collection. They wanted to prevent Mahinda camp coming to power. It doesn’t mean that people are for corruption. Things should not always be seen in black and white. Further to my earlier comment: I would like to hear from Mr. Aruna Chrishamal Warnasuriya – the No 2 in the National List of JVP who made a written submission that came through CT.as regards this resignation of Mr. Mayadunne. He was very much disturbed for nominating Mr. Handunetti in place of him. Would Mr. Warnasuriya have acted in the same way as Mr.Mayadunne? Interesting to know his opinion too. Thank you. We have got used to a subsistence economy and 90% of voters vote for parties and individuals who can deliver it. Not sure when we will make economic decisions rather than political decisions for the sake of our country. Unfortunate that even people like Harsha and Eran are not standing up to this. Finally, a man of principles! I am disappointed as I expected Mr. Mayadunne to play a vital role in Parliament and his voice would have been very strong and heard louder considering his unblemished record and integrity. However, we should respect his decision and by this he has shown to the world that he is not after positions. At a time when people who have been rejected are trying to creep in through the back door we have to salute and commend Mr.Mayadunne for his decision. I think this is the first time in the history of Sri Lanka an MP has resigned immediately after being sworn on a matter of principle. Mayadunne’s thinking is sensible. Eradication of corruption and educating the people on the correct approach to issues cannot be left to the politicians and the Parliament alone The intellectual civil society should formulate a proper mechanism to interact with the people on them Involvement of a good section of the civil society contributed to a good extent in the first steps taken on 8th January and more such by all and more is necessary to take Sri Lanka towards a good future. Congolese warlord known as the ‘Terminator’ appears in the Hague charged with war crimes. China is planning to cut down its troop strength by 300,000. Is there any connection between its stock market melt down and troop reduction? Avoid crab walk if you haven’t got a clue. I am glad that you are now into Stock markets and Employment. That is the way to go buddy, if you want to be an Elite with the dosh.Not just a Vellala Elite, eating Iddly and Sambar.. If you are in Canadian or Australian Diaspora , you have to get ready for a recession soon, after the arse falling out of the Commodity prices. If China sneezes those two Nations catch the Cold. Consensual politics of the corrupt is what my3 and RW has offered this country. Nothing has been done to wean the country of the corrupt politicians in fact even the politicians rejected by the people have entered parliament through the national list. The basic problem is that the 2 major parties are corrupt they can only offer the country corruption not development but destruction. Sad state of affairs for our beloved country. Thank you Mr Mayadunne for opening our eyes to reality. Absolutely spot on ! This Government has to educate the people first. The proposed changes in the SLFP should happen because the people look to their leaders for guidance and benchmarks. You are still too good for this times Parliament. Maybe after 5 years if Yahapalanaya works……. Excuse me, what the hell is happening here? Has the world turned upside down? The last thing that WE the people are likely to do is to give the JVP a mandate to clear anything, leave aside corruption. WE the people expect every Member of Parliament to combat corruption. It is nonsensical to think that there is a mandate for corruption. Sarathchandra Mayadunne was given a golden opportunity to strike a blow against corruption, and foster good governance, and he has peevishly thrown in the towel. This is like the best batsmen throwing away his wicket because the captain ate all his biscuits during the tea break. Sir, while I appreciate your decision, with all due respect I think if the people are not yet ready to move in the right direction it is the duty of the politicians to provide the necessary leadership and make the people go forward. We cannot wait till society changes. We have to act to bring about the desired changes. In this the political leaders have a vital role to play. Social change is the result of a dialectical process between the people and their leaders as we saw on Jan 8th and again on Aug 17th. If people were not ready these changes would have never materialized. C’mon Sir, I urge you to reconsider your decision. You are too much of an exemplary and valuable person for the people of this country to lose at this critical juncture. I applaud the JVP for appointing you as an MP through their national list. The whole country does. If Hon.Mayadunne continued in Parliament he would have been the Pearl amongst the Swines. Where is the “swaying with the wind” Sarath De Alwis who so blatantly disregarded the JVP’s misuse of their national list marketing gimmick (while denouncing the other parties) now? And the name being touted for replacement is not even from the national list! It is very clear the JVP has no interest in breaking in to the middle classes and will forever remain a bellicose contrarians in the opposition. I think Mr Mayadunne’s analysis is flawed. There was only a single issue at the last election. Are we going to stop Mahinda Rajapakse coming back to power or not? If we were to stop a Rajapakse come-back, then the only option was to vote for the UNP. If we voted for the JVP, Rajapakse would have had more seats in parliament and political power would have tilted back to the Rajapakse cabal. It is not that people didn’t care about corruption. They do. But the bigger threat was the spectre of the return of Rajapakse. To be sure, people did vote for rascals like Wimal Weerawansa and that criminal in Ratnapura, but the dynamics of such voting is hugely complex. It is something social and political scientists should analyse and clarify and for the civil society to remedy. By the same token it is also important to analyse as to why 4.7 million people voted for a coalition headed by someone who, by any sensible account, is repugnant in every sense of the word. Mr Mayadunne is a clean-corrupt free gentleman no doubt. His exit from parliament is not his own I guess, he’s been coerced by the JVP hierarchy so that full time loosing members can be accommodated. JVP was expecting a minimum of 15 seats and they boasted of nominating people of the caliber of Mayadunne on the national list to enhance their standing in public. Their calculations misfired and they have no option but to take this backward step. Before you resign from the Member of Parliament you have already seal off JVP mark politics, you should know that Party of JVP was anarchist and Terrorist roots was founded by PDN Wijeweera in 1965 anarchist OUTFIT. How can you become man of call Justice of Fair Politics? Mr Myayadunne? You had been University days, do you know that very well what was JVP? You selected JVP for position for power hungry man! You are after position and power by hook or crook! Go behind JVP? Is that proved and shows to public! That is hidden truth! of Your Member of Parliaments nominated by JVP. Do not attempted hoodwink Poor masses of People of our country. We know well that your politics of origin. You are not that reborn man? Thousands of Left political parties and leaders in various names of ‘Socialist’ terms has misled Working class and Peasants of Our soil. They totally betray cause of ‘democracy and Socialist’ task that belongs to Masses last 80 odd years since 1935! You try work on fish in trouble water. Your policies are sugar coted bullet for unknown new generations of Sri Lankan. Mr Mayadunne Knowing very well that current JVP party and leadership working with UNP’s Party vested interest against Democracy, Sovereignty and Territorial Integrity of People of Sri lanka. JVP is/was foreign hand control by very inception during PND Wijeweera days since 1965. In 1971 and 1988/89 they lunch not revolution but counter -revolutionary act. Of cause there are all act of rebellions are not always revolutionist in terms of Marxism. Revolt and rebellion are accepts by Marxist and Leninist but not that JVP counter -revolution not that cause for the “Socialism”. All JVP’s are ended up in UNP last 50 years since 1965. Current JVP working for UNP and US hegemony nothing NEW ,all JVP are funded by Western political interest. Before you being into politics I advice you read real term of Democracy and Socialism. Do NOT misled New Generation of Sri Lankan in name of “good Governance” by secretly support for UNP led rightwing Junta regime led by tested RightWwing leader of Ranil Wickramasinghe….UNP. Says he took oaths in deference to Parliament – but then he forgets that he has made the whole thing a joke – He did not refuse to be put on the List – He didn’t refuse to be nominated – Now he comes and takes oaths and resigns the very next day – the upright citizen and former public servant that he is should now at least refund the cost of the form on he signed.